Rory Staunton was a 12-year-old boy with the dream to grow up to be a pilot—he had fallen in love with the story of “Sully” and the miracle landing of the disabled jet on the Hudson River. Rory was diving for a ball at recess one day. He got the ball but scraped his arm. That night he awoke from sleep with pain in his leg; by the morning he had a high fever and was vomiting. He couldn’t go to school the next day. His pediatrician thought he had the stomach flu, a viral infection, but sent him to the emergency department to treat his dehydration from the vomiting. In the emergency department they sent “stat” (immediate) blood tests, but no one followed up on the results; they agreed with the pediatrician that it was a benign stomach virus and sent him home after giving him intravenous fluids. The next day Rory couldn’t get off the couch, wasn’t eating, and had a high fever that couldn’t be controlled. His parents got in touch with the pediatrician, who insisted that Rory had a gastric flu despite them telling her that he seemed to get worse and that they were worried. By the time she saw Rory for the second time, he was already in grave shape. The family went straight to the emergency department and Rory was admitted directly to the intensive care unit. Rory was fighting a serious infection. Bacteria had entered his blood, through the cut on his arm. Rory was in septic shock. He fought to survive, but it was too late. Rory died within 48 hours of streptococcal sepsis, a complication of the simple scrape on his arm, from a bacterial skin infection that went undetected. 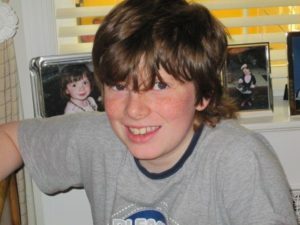 Rory’s parents, Orlaith and Ciaran Staunton, founded the Rory Staunton Foundation for Sepsis Prevention in April 2012 after Rory’s tragic death. Their goal is to ensure that no other child or young adult dies from undetected sepsis. The foundations’ mission is three-fold: to raise public awareness about sepsis to promote faster diagnosis and more effective treatment; to improve the diagnosis of sepsis through improved communication between parents and medical staff, and implementing rapid treatment protocols; and to provide support for those affected by sepsis, as well as giving them a platform for their voices to be heard. Rory’s spirit and passion for justice live on through the work of the foundation. Have you or someone you love been affected by diagnostic error? Share your story with us.